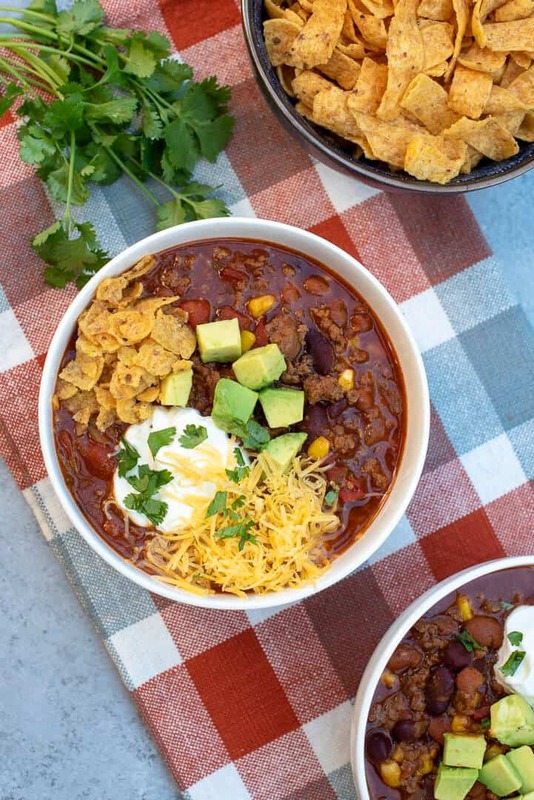 This flavor-packed Beef and Bean Taco Chili is loaded with ground beef, diced tomatoes, two kinds of chili beans, and corn. Let everyone add their favorite taco toppings and you’ve got yourself a hearty, super easy meal for your next game day party or any night of the week! 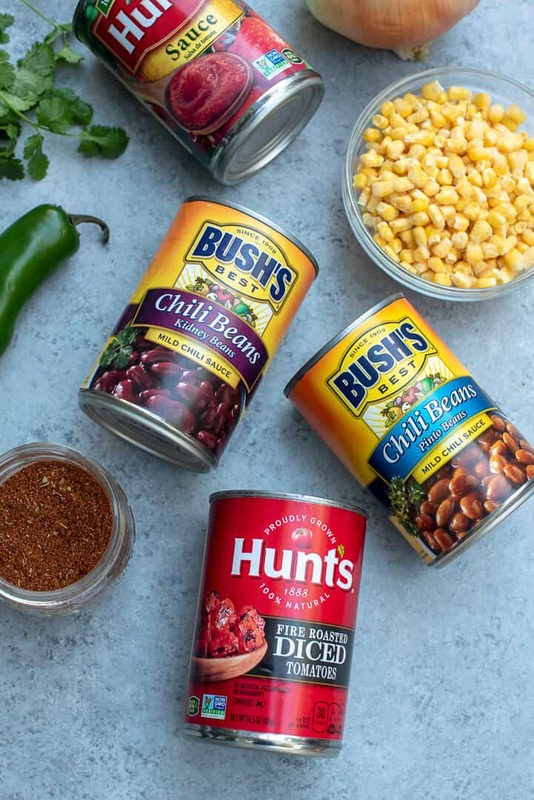 This is a sponsored conversation written by me on behalf of Hunt’s and BUSH’S Beans. The opinions and text are all mine. 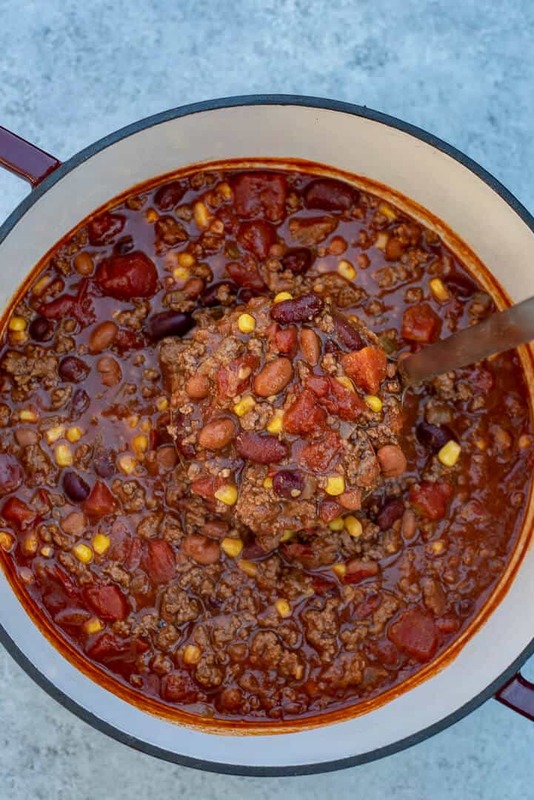 Chili season is in full swing, friends, and I’m sharing a new favorite today. 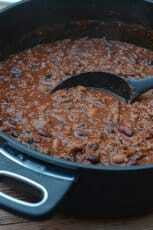 Chili is on regular rotation all through the year in our house. My guys love it and it’s such an easy option whether I’m home or away away for a good part of the day. But, it really does drive home that fall vibe when a big pot of chili is bubbling away on the stove while the football game plays on TV. 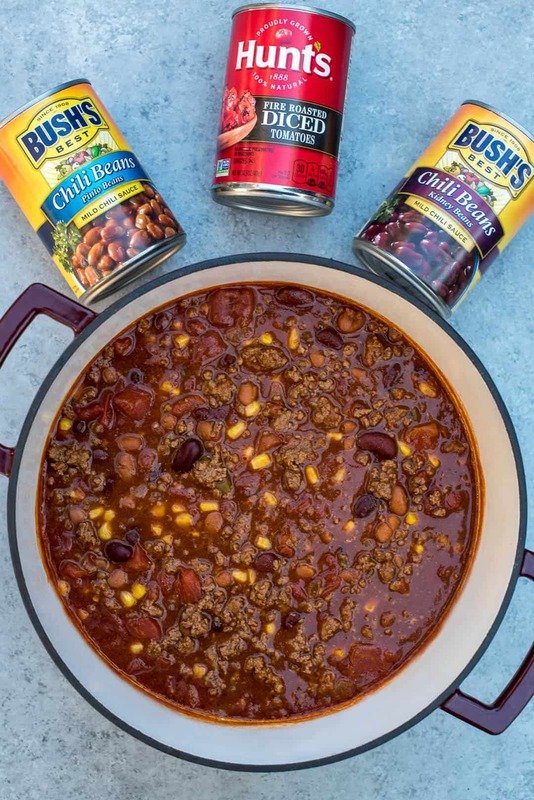 The ingredients I consider to be vital for chili success are Hunt’s® vine ripened tomatoes and BUSH’S® beans. I am a long time fan of both of these brands which is evidenced by the number of recipes that call for them on this blog. Hunt’s Fire Roasted Diced Tomatoes add a touch of smoky, roasted goodness that recipes like this one really benefit from in a big way. Since we are big on beans in this house, I went with two varieties of BUSH’S slow-simmered chili beans for this recipe – BUSH’S Kidney Beans in a Mild Chili Sauce and BUSH’S Pinto Beans in a Mild Chili Sauce. What makes these beans different? They are slow simmered in a hearty chili sauce with the flavors of ripe tomatoes, chili peppers and cumin which gives your chili a BIG head start in the flavor department. 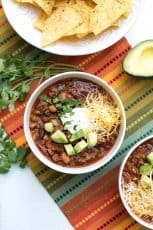 The mild variety of chili beans that I’ve used in this recipe adds zest but not a ton of heat so this is a super family-friendly meal. If you want to kick up the heat, leave some of the seeds when you dice your jalapeno. The rest is SO simple! 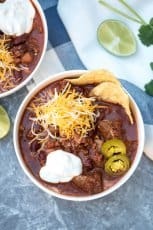 Instead of reaching for 5 or 6 different spice jars, just reach for the taco seasoning mix and it will combine in a seriously delicious way with the sauce from the chili beans to create this fabulously flavorful Beef and Bean Taco Chili! 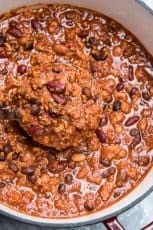 I highly recommend you mix up a batch of my Homemade Taco Seasoning Mix to keep on hand for this chili and all of your Mexican-inspired dishes. At the end of the cooking time, toss in some frozen corn for more flavor, texture, and color contrast. To drive home the taco concept I topped our chili with crushed corn chips, shredded cheese, a little sour cream, cilantro, and avocado and this chili has now been deemed “Valerie’s One Way Ticket to Flavor Town Taco Chili”! 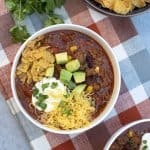 Show your “Chili Pride” and add your favorite taco toppings to make this chili your own and then visit www.chilipride.com to use the name generator to find out what to name your creation! 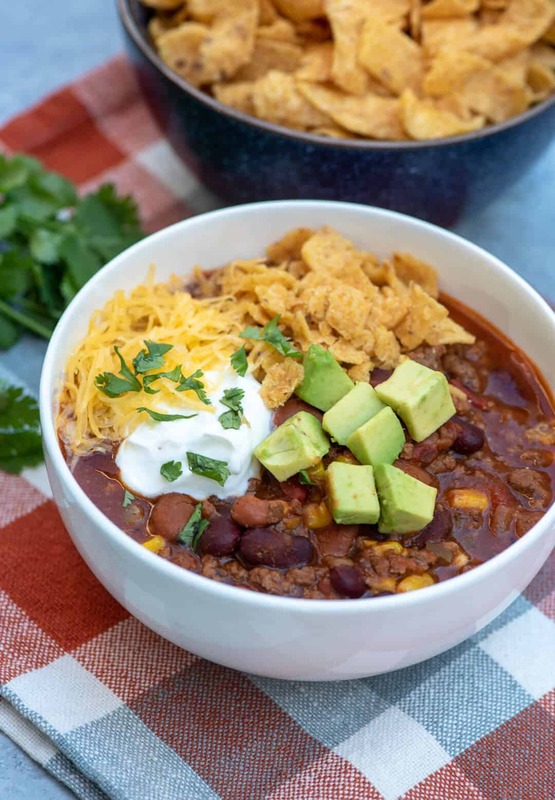 You’ll also find more delicious recipes from other proud chili chefs that are sure to inspire you to get your chili pride on! 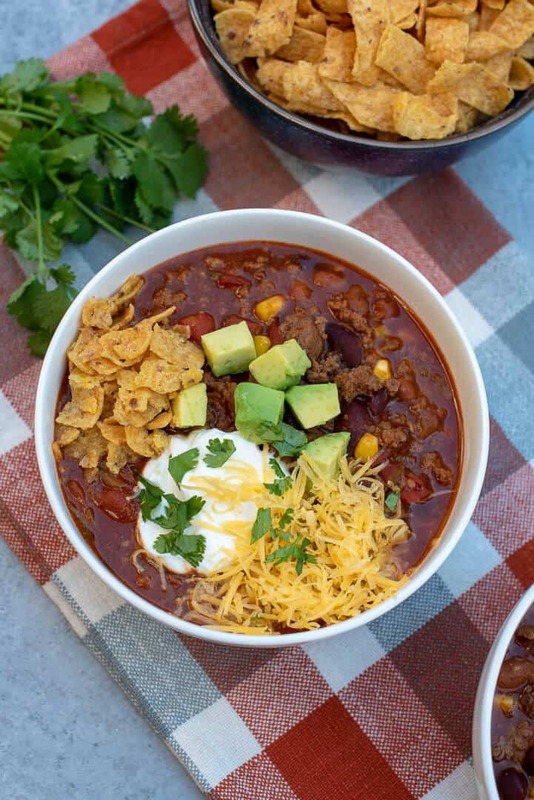 This flavor-packed Beef and Bean Taco Chili is loaded with ground beef, diced tomatoes, two kinds of chili beans, and corn. Let everyone add their favorite taco toppings and you've got yourself a hearty, super easy meal for your next game day party or any night of the week! Place a large pot or Dutch oven over MEDIUM heat and add the ground beef, onion, jalapeno, and garlic. Cook, stirring to break up the beef until crumbly and no longer pink, about 5 to 7 minutes. Drain off as much of the grease from the pot as possible and return it to the heat. Stir in the the kidney beans, pinto beans, diced tomatoes, tomato sauce, beef broth, and taco seasoning mix. Bring to a simmer over MEDIUM-HIGH heat, then reduce heat to LOW, cover, and simmer for 1 hour. Stir in the frozen corn and let the chili simmer, uncovered, for an additional 10 to 15 minutes. After cooking the beef, onion, jalapeno, and garlic as directed, drain it well and transfer the mixture to a 6 quart slow cooker. Add the diced tomatoes, tomato sauce, beef broth, and taco seasoning mix (reserve beans and corn for later), Cover and cook on LOW for 4 to 5 hours. Stir in the beans and frozen corn. Cover and cook on LOW for an additional 30 to 60 minutes.